courtesy of Dee Welch, BHSU Media Relations. Makaleb McKinnis heads to the basket against New Mexico Highlands in the RMAC championship game Saturday night. 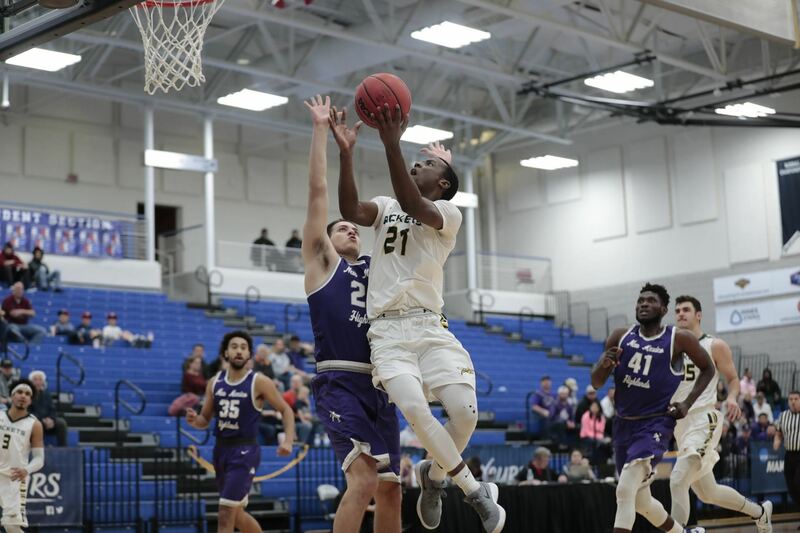 GOLDEN, Colo. – In the Black Hills State University men's basketball team's first ever appearance in the Rocky Mountain Athletic Conference Championship Game, the Yellow Jackets fell to New Mexico Highlands, 79-66, on Saturday evening. Stefan Desnica and Dez Stoudamire were named to the RMAC All-Tournament Team. Makaleb McInnis led the Yellow Jackets (18-11) with 16 points. He also had seven rebounds and six steals. Antonio Capley finished with 14 points and nine rebounds, while Stefan Desnica chipped in 13 points. Gerad Davis got the Cowboys (22-9) on the board first, and NMHU opened the game on a 7-2 run. The Yellow Jackets remained within touching distance, and with 8:18 remaining in the first, Dez Stoudamire nailed a three-pointer to put BHSU up, 22-20. However, the Cowboys pushed ahead, and led, 34-27, at halftime. The Cowboys came out of the locker room hot, while the Yellow Jackets struggled to score in the second half. New Mexico Highlands ultimately outscored the Green and Gold, 45-39, in the final period to win the RMAC Championship, 79-66. BHSU shot 37.7 percent from the field (23-for-61), while NMHU was 47.4 percent from the floor (27-for-57). The Yellow Jackets were 6-for-26 (23.1 percent) from beyond the arc, while the Cowboys were 8-for-25 (32.0 percent) on three-pointers. BHSU was 14-for-23 (60.9 percent) from the charity stripe, and NMHU was 17-for-20 (85.0 percent) from the free throw line. The Green and Gold was outrebounded, 40-37. Gerad Davis led the Cowboys with 21 points, while Raquan Mitchell had 17 points. The Green and Gold have a chance to make the Division II Tournament by earning an at-large bid. The selection show will be 8:30 p.m. on Sunday, March 10. If they do not make it, the Yellow Jackets finished the 2018-19 season with a 18-11 record, winning the most games since the 2010-11 season, and the most conference wins since BHSU joined Division II.